Artists: lesley Hilling, Nadav Drukker and Roger Hardy. The exhibition runs until the 18th of May 2019. 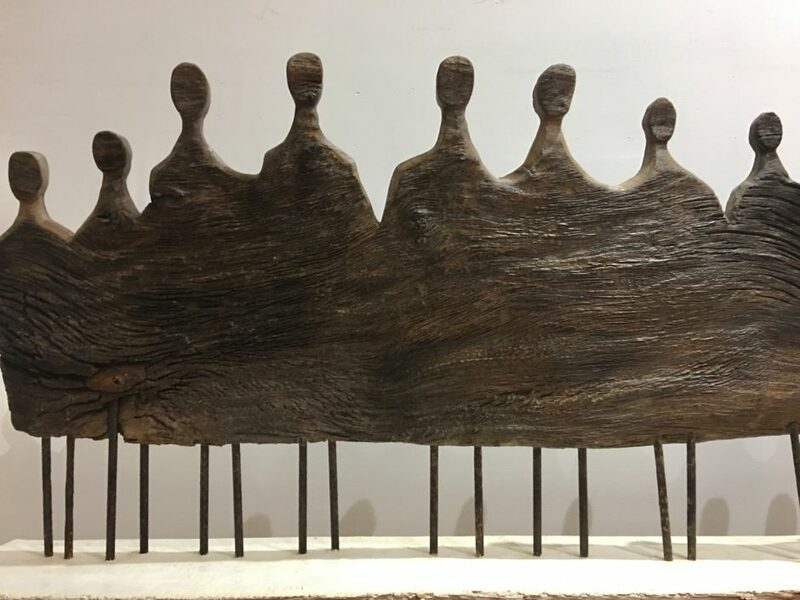 Hardy is a new addition to Knight Webb Gallery, carving his primitive figures in ancient River Wood from the shores of Suffolk. Hardy’s work embodies the ancient history of his materials, and reminds us of the Hunter Gatherers who first arrived in East Anglia, crossing Doggerland from europe before Britain was an island. Hilling produces intricate wall sculpture and standing towers from recycled and antique furniture. She is well known for deconstructing and reusing the entire carcasses of old pianos. Drukker makes ceramic pots and sculptural pieces which convey the beauty and innovation of his research in Theoretical Physics. Drukker heads a research team at Kings College London.